There are two things you can count on a Bandidos drink being: stiff and affordable. The Mexicano Mojito fulfills both of those qualifications, though it leaves something to be desired in the flavor department. That’s because the strong alcohol from three, count ‘em, three rums—Bacardi Light, Bacardi Dark, and Bacardi 151—makes it difficult for even a lush like myself to get down. Never fear, I rose to the occasion and finished that sucker, but it’s definitely a drink that’ll make you tipsy while you ponder just how much sugar and mint would be needed to make that much rum easier to drink. When I could get past the alcohol slap, I was happy with the typical mint, club soda, and sugar flavors, though I did long for some lime. 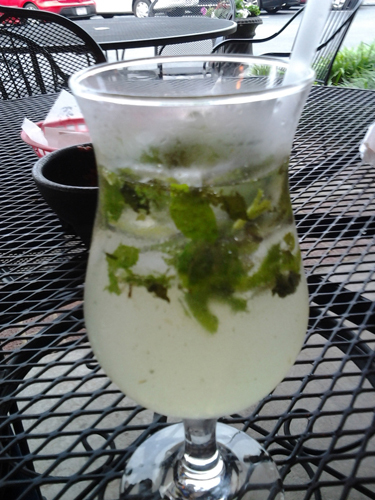 To sum up, the Mexicano Mojito tastes like a mojito that’s been invaded by an armada of treasure-seeking marauders. If you’re looking for a lot of alcohol for your buck, this might be the drink for you. Otherwise, I’d pass.